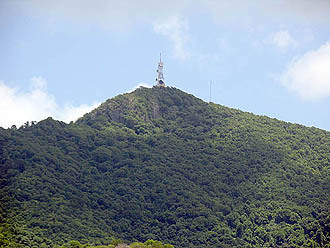 Mount Obama, formerly known as Boggy Peak, has a telecommunications tower erected in 1945 at its peak. "Your election will not only transform America, it can transform the world. Your message of change will ignite hope and action in people of many countries who might still be passive in the face of inadequacies and injustice." MOUNT OBAMA NATIONAL PARK, Antigua and Barbuda -- Although it stands just 1,327 feet above the azure ocean, we could see all of Antigua from the crown of this newly renamed summit. Early in the morning of Aug. 5 the sky already was veiled by a faint scrim of satin sunshine and dust, but we could still trace the whole perimeter of this 108-square-mile island named by Columbus in 1493. On clear days, I was told, one can also spot other islands on the northeast corner of the chain of pearls that studs the Caribbean Sea: Montserrat, Redonda, Nevis and Guadeloupe. In fact, from this vantage point and with a little awareness, it is possible to appreciate Antigua's past, understand its present and imagine a future. Until the new site is developed, however, both permission and guidance are required to climb up to the top. Even with both, start as early in the day as possible because of the afternoon heat. The ceremony was where we had met our guide, Kim Derrick of the Environmental Awareness Group of Antigua and Barbuda. She had agreed to lead us up early the next day. We met her at the entrance gate shortly before 8 a.m., joined on our climb by Brian Cooper, also an EAG-Antigua volunteer, and Eric Brown, an Antiguan gentleman and neighbor of Ms. Derrick's who'd always wanted to see the view from the top. Following the red and blue ribbons tied to trees, we picked our way along the edge of a deepening ravine that cleaved the wilderness forest of candlewood, Spanish oak, mahogany, mango, fig, fern and the vines of myriad hanging species. It took us two sweaty hours to climb the steep, lightly marked trail to the old telecommunications tower at the summit. - Photo by Brian Cooper. Of course in another sense this journey had been centuries in the making. It is always a notable event when a politician from one nation is moved to confer such a tangible honor on a living politician from another country. Skeptics might suspect a pure public relations ploy, but the fact that Mr. Spencer had announced his vision the morning after the U.S. presidential election suggests evidence of more heartfelt motives. "This great political achievement by Barack Obama resonated with me in a way that I felt compelled to do something symbolic and inspiring," Mr. Spencer explained in his dedication remarks to the audience of several hundred dignitaries and guests that included U.S. Rep. Yvette Clark, D-N.Y., and actresses Marianne Jean-Baptiste and Angela Bassett. 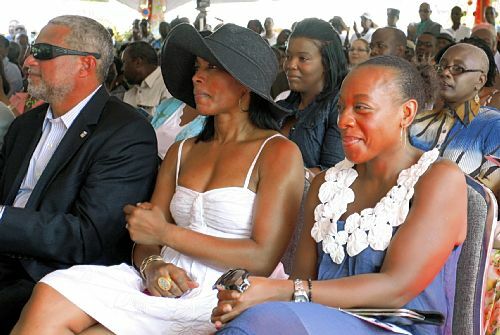 Actresses Angela Bassett, center, and Marianne Jean-Baptiste, right, accompanied by Antigua and Barbuda's Tourism Minister John Maginley, attend a ceremony renaming Antigua's highest mountain "Mount Obama." "As an emancipated people linked to our common ancestral heritage and a history of dehumanizing enslavement, we need to at all times celebrate our heroes and leaders who through their actions inspire us to do great and noble things," Mr. Spencer said with visible emotion.Read the full speech. Judging by the numerous Obama street signs, bumper stickers, salsa bottles and other evidence of affection we saw across the island, Mr. Spencer was not alone in his sentiment. Another speaker, Monique Barbut, CEO of the United Nation's Global Environmental Facility offered evidence of Antigua and Barbuda's commitment to sustainable ecology. Read full speech. The official remarks were followed by a program of poems and dance, including a particularly poignant performance by the recently crowned Monarch of Antigua's 2009 calypso competition, Trevor "Zacari" King, who sang his "It was for you Barack." "His song wasn't just about Barack Obama," Ms. Bassett observed later. "It's about the history of black people around the world and the struggle and sacrifices that have been done so that he could rise to the position that he is in today." Then the monument was unveiled. 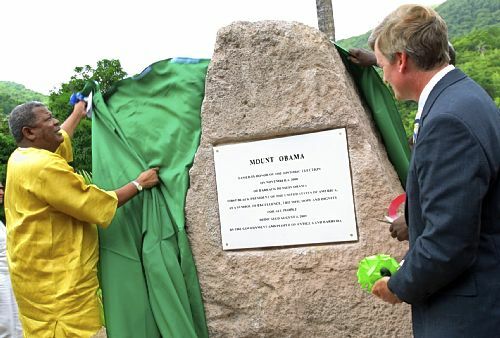 Antigua and Barbuda's Prime Minister Baldwin Spencer, left, unveils a stone monument and plaque honoring President Barack Obama on Aug. 4, his 48th birthday, by re-naming the country's highest mountain "Mount Obama." Crafted from blocks of stone cut by African slaves for the naval base England established on Antigua in 1725, its plaque reads: "Mount Obama, named in honor of the historical election on Nov. 4, 2008, of Barack Hussein Obama, the first black president of the United States of America, as a symbol of excellence, triumph, hope and dignity for all people." In the wake of Mr. Spencer's bold November announcement, some consensus for making the change was reached among Antigua's contentious two-party government, and an appropriate date for the renaming was selected, Aug. 4: Mr. Obama's 48th birthday. No matter that the selected date also happened to be the climax of Antigua's vibrant, colorful, raucous, weeklong Carnival celebrations. Rather than the quasi-religious, pre-Lenten festivities held elsewhere, Carnival on Antigua is a mid-summer celebration of freedom held yearly since 1957 around the first Saturday in August, the holiday commemorating England's 1834 emancipation of slavery in its colonies in 1834. Antigua's Carnival is more or less a continuous Calypso celebration that unfolds over four nights and five days on the streets of St. John's, the capital and primary city. Like Carnivals elsewhere, it's a time of exuberant abandon and group expression, but it's held in the heat of summer and observed with amazing fervor, estimable stamina and non-stop steel-drum music. The festivities commenced on Friday evening with Calypso concerts followed by the two-night Calypso Monarch competition held in the city’s stadium and playing on into the streets through the wee hours. The partying continues Monday morning with the J’ouvert, a lightly organized bacchanal that throngs the streets from 4 to 11 a.m., during which great volumes of liquid libations were consumed. That being said, it was a good natured affair, and the streets were almost immediately swept clean to prepare for the next acts. 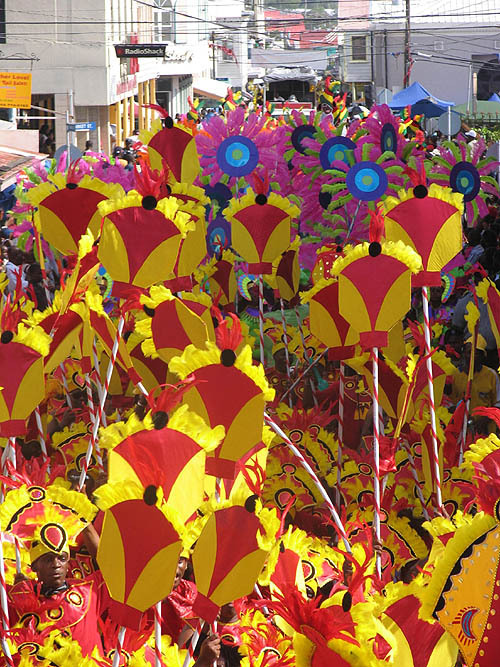 Carnival’s culminating events are the two Mas Parades, splendid spectacles of costumed, sweet abandon in which a significant percentage of the island’s 70,000 residents take an active role. The practice parade is held Monday afternoon and the judged competition on Tuesday, with the final standings being officially judged and hotly contested. For more than two and a half hours on Tuesday afternoon we watched a steady stream of Antiguans strut their stuff through the city’s packed streets. The different troupes were accompanied by semi-trailers trucks bearing live bands and towered so high with loud-speakers that men rode on top of the pile to lift wires hanging low between the street poles so they could pass beneath. Amazingly, despite abundant alcohol, sleep deprivation, and traffic congestion verging on chaos, it all unfolded with a vibe that made it very much a family affair, a jubilant afternoon of abandon shared by children, seniors and all ages in between. Indeed, many of the same dignitaries who attended the Mount Obama dedication at noon in costume parading through St. John’s at four p.m., including the Prime Minister and much of his cabinet. On Antigua, any activity that competes with Carnival requires considerably more conviction than usual. But they pulled off the Mt Obama dedication in fine form. The selection of Boggy Peak to honor Mr. Obama also has historic relevance. Documents indicate that in 1647 its forested ridgeline provided refuge for several dozen slaves fleeing a revolt on the island's sugar plantations below. English militia eventually stormed their palisaded camp, and the leaders were hauled off and burned alive. But there is little tangible evidence of the events. The U.S. Navy construction crews who gouged an access road up the seaward side of the slope in 1945 and erected a telecommunications tower on the peak, gave no thought to preserving ancient artifacts. An exploration into the area's history is only one part of the still emerging plan for this nascent national park. As early visions of Mount Obama took shape, it became more than just a renamed peak. With an emerging awareness of issues regarding the natural environment, sustainability and preservation and management of the area's historical resources, as well as for the enjoyment, of Antiguans in these matters, the project's goal has blossomed into the creation of a full-fledged Caribbean national park. The naming of Mount Obama has become the spark of an ambitious, long-term effort that will require developing a new kind of awareness in the Caribbean. Seeing that effort to fruition will certainly stretch Antigua's assets, especially in what are difficult times. Like many destinations, the island's economy is substantially based on tourism, which is struggling everywhere. Yet, if history and present realities are any indication, this future-facing nation has the means and vision to see its way through challenging times. Who knows? Perhaps one day that nearly obsolete communications tower at the peak of Mount Obama could be transformed into an observation platform of the highest order. At very least, they should install a bright green light at its top, a beacon for all to see, a lighthouse to guide the Caribbean to an ecologically and environmentally sustainable future. Slideshow from this special event.